Friends of Bristol Art Gallery: DiscoveryPENS - Now Active! DiscoveryPENS give those with impaired sight the opportunity to enjoy visual arts through the medium of recorded descriptions which they can listen to through headphones as they make their way through galleries. The PENS recognise a mark next to the exhibit which tells them which description to play (a bit like scanning a barcode). The Friends responded to the call for helpers to describe paintings onto DiscoveryPENS (a replacement for the earlier Penfriends), and they have all made recordings along with those made by staff from the Museum. The PENS are now in use in the French Gallery, having been “launched” by Paul Sullivan, who leads on access and inclusion for the Museum service, on 12 March. Paul says: “I am really grateful to everyone for their enthusiastic support for this brilliant collaborative effort”. DiscoveryPENS play recorded information when touched to a “sound spot”, normally on a wall label as in the photo of Paul, who is ‘loading’ his pen with a description of Corot’s Fontainbleau – en Foret. 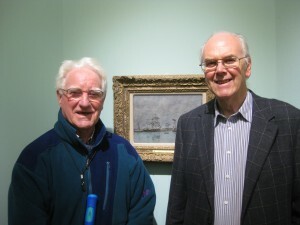 The descriptions do not always just repeat what is printed on the wall label — Paul has encouraged volunteers to say also what the painting means to them, what they see in it, the memories it brings them, and how it affects them emotionally. Although intended originally for use by visually impaired visitors, the DiscoveryPENS are available and enjoyed by all who use them — and they are free, anyone can collect a Pen from Reception and use it straightaway, it’s so easy to do. Apart from the French Gallery DiscoveryPENS are also currently in use in the Turner in the West exhibition (Balcony Gallery) and the Assyria and Egyptian Galleries. 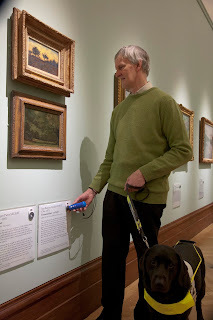 Thanks to a grant from the Clothworkers Foundation, the museum has recently bought 100 of the devices and in time they will be introduced to more galleries throughout the Museum. A video of the DiscoveryPen launch event is now available here. Some of the members present at the launch who have been helping Paul: Margaret Kirkham, Jim Broughton, Christine Haley, Polly LLoyd and Austen Bracken. Tony Kitt was present as The Friends secretary. 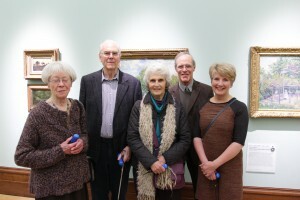 Other members who made recordings but could not be at the launch were: Jenny Haines, Annie Lewis, Gareth Lewis, Ann Nosowska, David Mascord and Anne Merriman ie in total 10 members have made recordings on the DiscoveryPENS.